Louis LeBlanc was born on October 15, 1935, in Woonsocket, Rhode Island. He enlisted in the U.S. Air Force on May 10, 1954, and completed basic training at Sampson AFB, New York, in July 1954. Sgt LeBlanc next attended Airborne Electronic Countermeasures (ECM) School at Keesler AFB, Mississippi, from July 1954 to March 1955, followed by service as a B-36 Peacemaker ECM Operator and ECM Repairman with the 31st Bomb Squadron at Travis AFB, California, from March 1955 to March 1957. He served as an ECM Repairman with the 5th Aircraft Maintenance Squadron at Travis AFB from March 1957 to October 1958, and then with the 4134th Aircraft Maintenance Squadron at Mather AFB, California, from October 1958 to January 1960. After completing B-52 Stratofortress Combat Crew Training, Sgt LeBlanc served as a B-52 gunner with the 72nd Bomb Squadron at Mather AFB from April 1960 to April 1961, followed by service as a B-66 Destroyer Defensive Fire Control Systems Operator with the 85th Bomb Squadron at RAF Sculthorpe, England, from May 1961 to July 1962. His next assignment was as a B-52 Defensive Fire Control Systems Operator/Tail Gunner with the 23rd Bomb Squadron at Travis AFB, California, from July 1962 to September 1967, and then as a B-52 gunner with the 6th Bomb Squadron at Clinton-Sherman AFB, Oklahoma, from September 1967 to December 1969. During this time, Sgt LeBlanc deployed with to Southeast Asia and flew Arc Light bombing missions from June 1968 to June 1969. He then served as a B-52 gunner with the 2nd Bomb Squadron at March AFB, California, from December 1969 until he was forced to bail out over North Vietnam and was taken as a Prisoner of War on December 22, 1972. After spending 98 days in captivity, SMSgt LeBlanc was released during Operation Homecoming on March 29, 1973. His next assignment was with Headquarters 15th Air Force at March AFB from March 1973 to March 1975, followed by service as a B-52 gunner back with the 2nd Bomb Squadron at March from April 1975 to December 1976. He then served as a B-52 gunner and Wing Defensive Aerial Gunnery Program Manager with the 22nd Bomb Wing at March AFB from December 1976 to January 1981. His final assignment was as Defensive Aerial Gunnery Program Manager for the 43rd Strategic Wing at Andersen AFB, Guam, from January 1981 until his retirement from the Air Force on October 1, 1983. Louis LeBlanc died on August 23, 1997, and was buried at the Guam Veterans Cemetery in Piti, Guam. 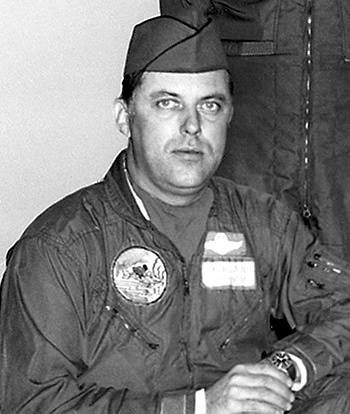 Master Sergeant Louis E. LeBlanc, Jr., distinguished himself by heroism while participating in aerial flight as a B-52 Gunner in Southeast Asia on 22 December 1972. On that date, Sergeant LeBlanc participated in high priority bombing missions against vital military targets in heavily defended areas of North Vietnam. Despite the intensity of the defensive reaction and the extreme hazard posed by numerous surface-to-air missiles and hostile interceptors, Sergeant LeBlanc displayed extraordinary courage and a remarkable ability to place the mission requirements above his personal safety. He maintained a constant watch for enemy fighter attack and other threats, thus enabling his crew to deliver their ordnance on the designated targets. The outstanding heroism and selfless devotion to duty displayed by Sergeant LeBlanc reflect great credit upon himself and the United States Air Force.